Sitting in my hotel room (one of the box’y, container’ish and non-superfluousness-yet-no-hassle one’s with ‘business-person-only-in-town-for-a-short-business-meeting’ written all over it) sipping some mediocre, yet drinkable wine with screw-cap from New Zealand bought in the local “non-7/11-yet-still-open-24hours-drugsstore” the day begins to settle in this old brain stuck to the top of my neck. Let me start by stating that Ralph Hauwert is one of the “real” ones. He is a nerd that has turned pro ! Ralph Hauwert is quite a lucky man, because his product (PaperVision 3D) sells itself – so even if he had not been the talented speaker he is and had he not been the jovial guy residing on top of what appears to be pure high-level competence, he would have made anyone in the place today go home with a shitload of inspiration and a lot of “so-ein-ding-muss-ich-auch-hapen” feeling regarding the many demos shown during the day in their respective pockets (S.E.D.M.I.A.H. 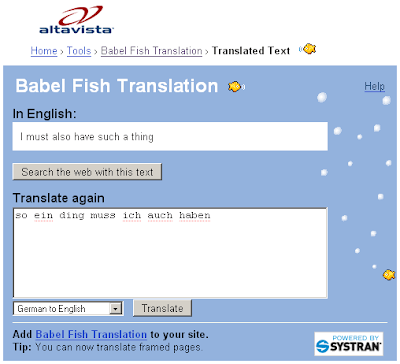 : please check the image of a real BABELFISH translation later in this post). After having asked Ralph Hauwert (during the post-session informal QA that always happen when the speaker acts a roadie and packs down his/her gear) about an explanation for the lack of documentational focus from the PV3D team, the answer proved to be quite a bit more clever than the question. It appears that PV3D have more than 400 1st-line developers using the API who are not only using the API, but also putting great effort into reporting bugs and issues to the PV3D team. The reports harvested from this impressive group of early-adopters are of a reportedly high quality and naturally: its a very relevant fear from the PV3D team that if a “normal” Java-doc like documentation and versioning paradigm was implemented, it would spawn of a plethora of “not-so-diligent” masses of developers with no particular interest in bringing PV3d to the next level that would start bombarding the bug-reporting-system with mere incident-reports and not actual bug-reports. The PV3D team would, if the API was published publically, hence probably end up being tied down into a never ending trench of bug-reports made by people from all corners of the web-development industry with no particular interest in the PV3D platform and that would effectively be the end of PaperVision (This particular course of events have been seen before, remember? ). I personally believe its a quite clever move by the PV3D team to steer clear of painting themselves into a corner by the act of exposing themselves to the vast community of (lets face it, this group to which I belong in this context are an obnoxious and ignorant group of non-forgiving and intolerant “revengees”) early-adopters and first-movers on a hyped-up-technology which in many people’s eyes may contain unlimited possibility of both profit and fame , which we all know is a very efficient recipe for problems when attempting to release a new API which is challenging in its nature. About the concrete contents of the session, I will post from my notes when day number 2 has passed and I again will be sitting alone in a hotel-room with nothing better to do than to post to my blog. Next postAdobe Flex Builder : Beta 3 released !